As its name suggests, the Lake District of the North West region of England is home to numerous large lakes. Although this national park owes its current appearance to the activity of glaciers, the landscape actually has a rich history of complex geological processes dating back half a billion years. 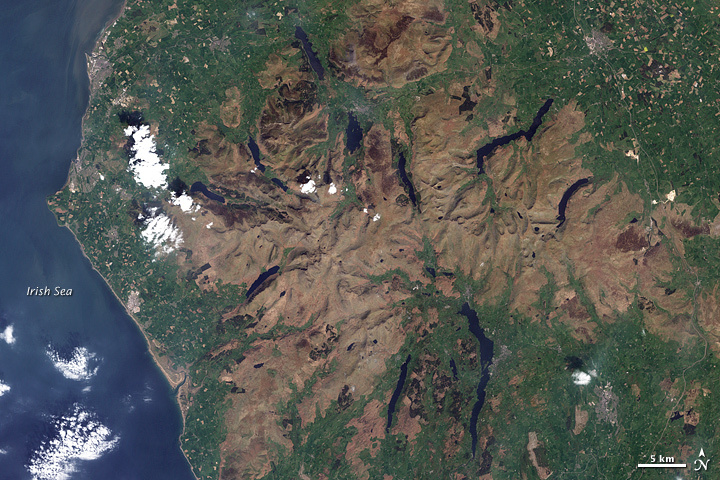 The Enhanced Thematic Mapper on NASA’s Landsat 7 satellite captured this natural-color image of the Lake District National Park on May 7, 2000. 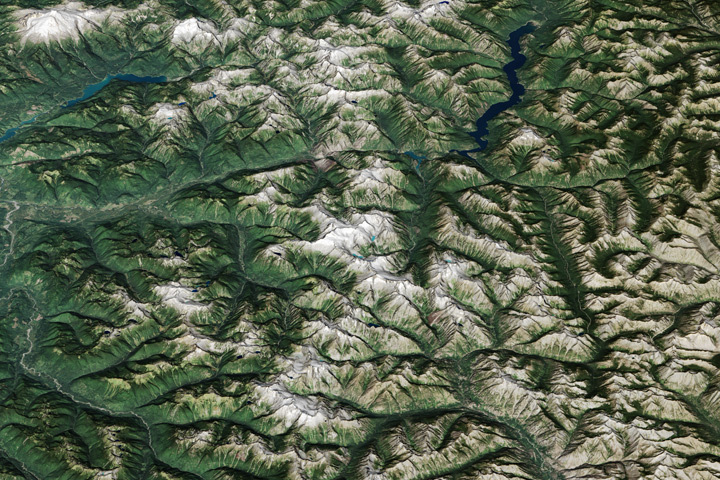 Earth-toned crags rise above lower-lying lands carpeted with green. Like scratch marks from giant claws, the long, twisted lakes generally radiate outward from the center of the park. About 500 million years ago, the oldest rocks in the area sat at the bottom of an ancient sea. Oxygen-poor mud and debris settled on the sea floor and hardened into rock that has persisted over hundreds of millions of years. It is now named the Skiddaw Group, and its rocks are exposed in the northern third of the park. About 450 million years ago, the collision of tectonic plates initiated a period of intense volcanic activity. The resulting rocks comprise what is now known as the Borrowdale Volcanic Group, which forms the base of the mountainous middle of the park. The rocks are conspicuous brown peaks rising above the vegetated surroundings. The southern third of the Lake District consists of slates, siltstones, and sandstones. Called the Windemere Group, these rocks formed at the bottom of the ocean about 420 million years ago. About 400 million years ago, a mountain-building event known as the Caledonian Orogeny thrust all the rocks out of the sea, and magma reshaped the rock layers into complex configurations. The mountain range may have rivaled the height of today’s Himalaya, but millions of years of erosion wore the rocks down to low-profile hills and by 350 million years ago, the land was once again at the bottom of an ancient ocean. A layer of sea life detritus coated the older rocks, and those fossil shells and corals persist in the Lake District today. During the Carboniferous Period, mud infiltrated the shallow sea. 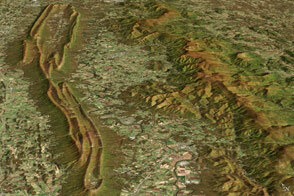 Some 280 million years ago, another mountain-building event, the Variscan Orogeny, again lifted the rocks. In the hundreds of millions of years since today’s Lake District rocks formed, they not only rose and fell vertically, they also traveled northward. The rocks of today’s national park sat well south of the Equator about 500 million years ago. In much more recent geologic time—2 million years ago—Pleistocene glaciers crept southward to cover most of mainland Britain. The glaciers advanced and retreated multiple times, carving deep valleys that later filled with melt water and rain. The volcanic rock holds the water in place rather than allowing it to seep out, sustaining the lakes that give the park its name. 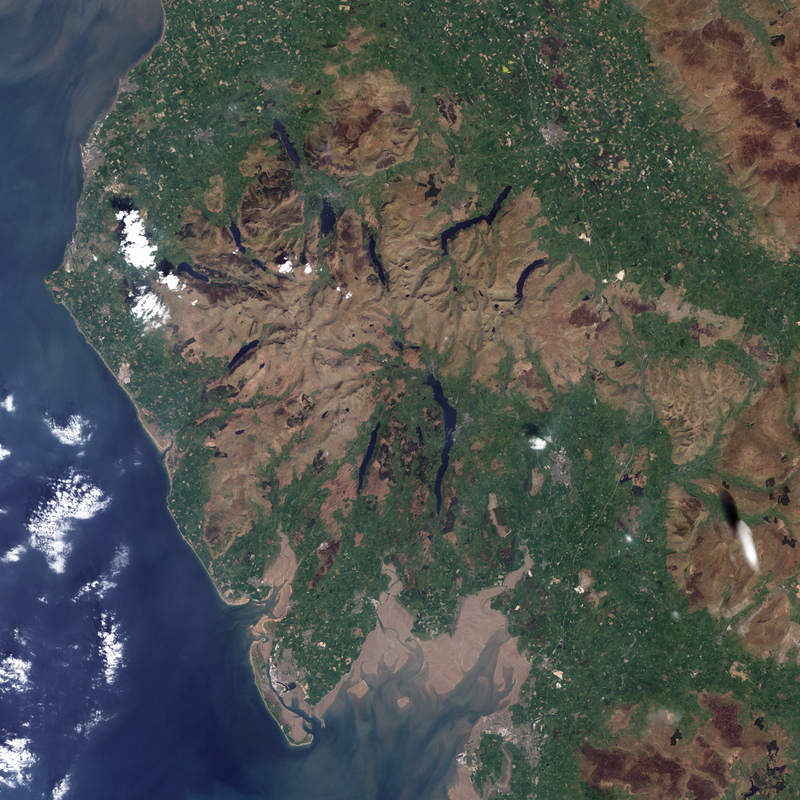 Acquired May 7, 2000, this natural-color image shows the Lake District National Park of North West England. Lake District National Park. Geology. Accessed December 14, 2010.